Treatment with the light system is simple and painless. 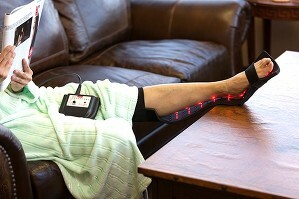 Flexible pads, containing multiple infrared and visible red diodes, are placed directly on the skin over the area of pain or injury. Light energy from the diodes penetrates beneath the skin and is absorbed by proteins within cells that lay beneath the skin. Those cells release nitric oxide, the body’s natural vasodilator. After just 20 minutes of treatment, blood flow is increased to nerves and other tissues, and this boost in local circulation persists for several hours after the pads are removed. Light therapy is typically given for a minimum of one to three times a week for 2-3 weeks up to 8-12 weeks depending on the severity of the condition. If treatments can be given more frequently….. 4-5 times a week … blood flow often improves more quickly and positive outcomes are seen in less time. Polychromatic Light Therapy, is a unique therapy that harnesses the healing powers of infrared light. Unlike normal blue, red or yellow light, near infrared (also known as IR) light is invisible to the human eye. 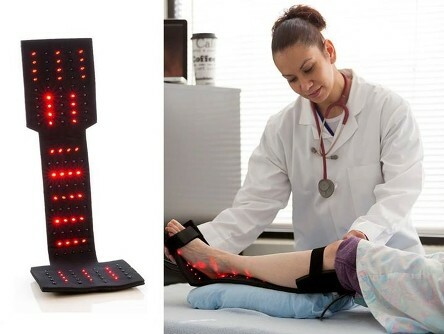 It emits special wavelengths of light energy that dramatically increase circulation to injury sites and areas of chronic pain. The IR light has been reported to dilate blood vessels at the site of treatment. The result tends to be a more rapid relief of discomfort, improvement in sensation, and regeneration of damaged tissues. Light energy is not only essential to life, it provides powerful support to the body’s natural healing processes. LED light energy, delivered via light emitting diodes at various wavelengths, penetrates tissue at different depths, and is naturally absorbed by the cells to assist in the production of ATP (adenosine triphosphate), energy required for cell repair and regeneration. LED light energy application also facilitates the release of Nitric Oxide, a natural response, supporting the body with improved circulation. Improved circulation (blood flow) is one of the most vital components of the healing process. LED light energy is a valuable tool in restoring and improving health and vitality. When there is a lack of oxygen and glucose in the blood vessels. Adenosine triphosphate (ATP) production decreases, which is sensed by nerves and sent to the brain as either pain or a lack of sensation in the outer extremities. Light Energy stimulates the release of nitric oxide from hemoglobin, which enters the muscle cells through the walls of the blood vessels, causing the vessels to increase in diameter and allowing more blood flow, increasing oxygen and glucose. The increase of oxygen and glucose, along with stimulation from Infrared Light Therapy, increases ATP production. This decreases pain and inflammation, and increases tissue regeneration in the localized area. FDA cleared for increasing circulation and reducing pain. They are not cleared specifically for treating diabetic or other neuropathies, but indicated for some of the symptoms associated with peripheral neuropathy. Benefits of the different lights. P450 enzyme group…P450 enzymes get their name from “Photon 450 nanometers” which is blue light. isomerization of bilirubin- prevents jaundice, can prevent psoriasis in some cases. Stimulate DNA telomerase enzyme which is responsible for rebuilding the telomeres (protective tips) of the DNA strand and also helps to rebuild lost proteins which hold the information for things such as hair color, etc. Assists with mood disorders and increased neurotransmitter production, specifically serotonin. Toenail fungus or fungal conditions of the skin. Eradicates MRSA bacteria and certain forms of strep. and staph. on exposure. DNA and RNA synthesis which helps the cells to produce proteins to fix themselves and also aid other cells by donating these proteins. Combine Polychromatic Light Therapy with our Hyperbaric Oxygen Therapy or Quantum Biofeedback Therapy and speed healing even more quickly.